Our team traveled to Minnesota's Twin Cities this February for a winter weekend of seminars and hands-on time with some of the cycling industry's newest technologies, and updates to some reliable favorites. We couldn’t wait to learn more about SRAM’s brand new top of the line wireless AXS groupset (a packaged collection of cranks, gear clusters, etc.) available with rim brakes or disc brakes that comes with an app (!! ), as well as Surly’s Big Easy – a steel framed e-cargo bike (basically a cargo bike with pedal assist). Both of these are game-changers. Purists may scoff at e-bikes, but we need them more than ever – just ask The Radavist. If the New England hills have been a barrier, perhaps the Big Easy can help make your best life a little more accessible. We also took advantage of the chance to experience our distributor's wheelhouse, where some of the best complete wheels in the business are built, tested, and shipped to stockists like Dash Bicycle. It's not difficult to take for granted that a bicycle wheel is a collection of precision-engineered parts, including the rim, spokes, and hub, which areÂ laced together by a professional. 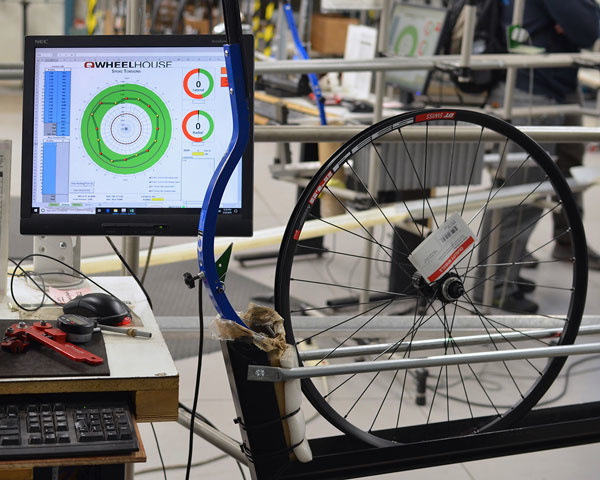 Building a bicycle wheel is a skill, and we got to watch wheels being laced by hand before being quality-tested by a robot. When a wheel doesn't pass the battery of tests, it is rejected and replaced by fresh hardware. All stock wheels are guaranteed to perform right out of the box, and save you time and money. If a stock wheel set isn't going to cut it, or if you need a custom build with more bling (or maybe you're just worried that HAL won't open the pod bay doors) our team of mechanics will gladly help you order all of the right components and build a custom wheel-set for you, in house.